Translation: Hanae Watanabe, including illustrations for The New York Times, New Yorker and other collaborations, the likes of MTV or Warner. In fact, he recently awarded as a Young Gun by the Art Directors Club. 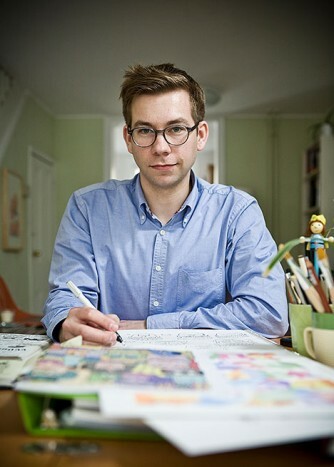 In addition to his commercial work, Andy has exhibited in America and abroad. He likes to work in different ranges: painting and digital animation, and specially hand drawing. What’s more, he also had the opportunity to attend Fabrica, the Benetton’s super creative head-quarters in Treviso, north of Italy. Are you in the need to travel a lot? I need to travel frequently for my work as well as for my peace of mind: it’s crucial to leave my comfort zone and find new stimuli. I spend a lot of time in New York and London, two of my favorite cities, but there are so many places that I’d like to know better. Tokyo and Japan are #1 on the list! I think you use a wide range of technics, so besides the computer you like hand-made drawing. Could you let me know about this more specifically? Every assignment starts with a hand drawn sketch. Of course the computer is also involved in the process, but I strive for the artist’s hand to come through somehow. My original art pieces instead are entirely hand made. Do you consider yourself a typographer as well or have you created any actual typeface so far? Type and lettering are very important for me. I have created many typefaces for personal and professional use while working as a designer. I wouldn’t consider myself a typographer, but more a devoted lover of typography. Please tell us a few tips about New York City! New York Art Book Fair at Moma PS1.